This begins a series of articles that I will be written leading up to the National Republican and Democratic Primaries, with my take on Donald Trump, his Jeffersonian influence and his Libertarian Ideals. Mr. Donald Trump – An Libertarian or Not? There has been much written about the political process, the political candidates for the Presidential election, senatorial and congressional elections and even the local elections that concern all of us in Pinellas County and elsewhere around the country. Each of us has our own unique, or shared, political views. Some of us are hard, party-line voters with ideals that do not change. Some of us are flexible voters who analyze each candidate we are eligible to vote for and base our decisions based on the policies they preach. Many of us are completely ignorant of the political process, and as much as the greater United States doesn’t want to admit it, a great many voters are completely ignorant of what each politician stands for outside of the spin that the mainstream media bombards them with. However, there are two types of voters that stand out: the revolutionary and the enlightened. These may seem like bombastic descriptions, but if you bear with me through this analysis, let me explain. The revolutionary voter is inclined to align him or herself with the candidate that speaks to the oft unspoken ideals, like Bernie Sanders who is so far out of the mainstream of public policy that his policy proposals are nothing but revolutionary in the country. He is radical, charismatic and intelligent. A potentially lethal combination. The enlightened voter is similar in their choice of candidate to the flexible, with the distinction that they will look beyond their personal interests to the greater good of the country and world. So the question begs: do we have any enlightened candidates? I theorize that we do. We have one candidate this election cycle who most closely represents the political ideals that our founding fathers, in part espoused, of personal freedom, small federal government and an increased sense of social mobility and hard work. Who embodies this decidedly Jeffersonian outlook? None other than Mr. Donald J. Trump. How? How can anyone say that this bombastic lunatic, with such aggressive rhetoric and tenor can be considered in the same philosophical league as such illuminaries as Thomas Jefferson, James Madison, James Marshall and Benjamin Franklin? “Q: Are you going to get rid of entire departments? Q: what is another agency you’d get rid of? TRUMP: Even in the military, I’m going to build a military that’s much stronger than it is right now. But you know what? We can do it for a lot less. This is a man who wants the federal government to spend less money, cut out oversight on defunct organizations and bring the economy back to the working class of the United States of America, where those who are in the game can flourish and prosper. 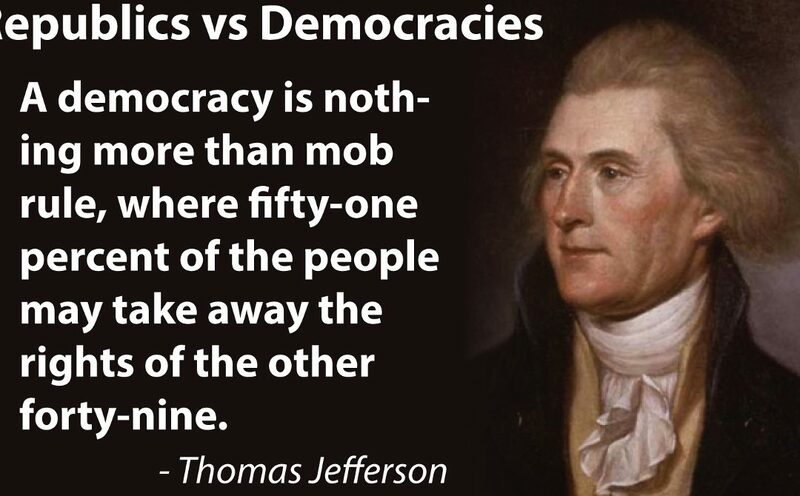 This is one of the core arguments of Jeffersonian Principle. Thomas Jefferson killed departments that he considered a waste of federal resources, and by extension that of the people’s. Thomas Jefferson encouraged individuals to work, albeit in agriculture primarily, but we move adapt with the times, and that too was something Jeffersonian principle dictate. These are strong indicators that Donald Trump is an enlightened political candidate, and not merely a revolutionary candidate who wants to bring drastic change to the societal make-up of this country, and to be damned with the results. You may not like him as a person, and no one is asking you too. But, for those who are not party-line voters or ignorant of the political process, Donald Trump is one of the best candidates we have seen so far this century.